At first you might assume the 'drumstick country' would probably be Turkey. But as you can clearly see, Turkey is not shaped like a piece of a Turkey at all. No, that would be Niger. 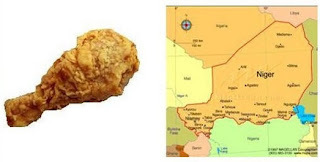 Turkey is shaped more like a chicken McNugget©. I hope this clears everything up for you. Class dismissed.